Happy New Year to all my Brothers and Sister of every faith, race and creed around the world! May God bless you all this year with health and happiness, wisdom and love. I can think of no better resolution for the New Year than to resolve to be of service in any way we can, and to repeat these noble words and lovely prayer. Everybody can be great…because anybody can serve. You don’t have to have a college degree to serve. You don’t have to make your subject and verb agree to serve. You only need a heart full of grace. A soul generated by love. – Martin Luther King, Jr.
And your Lord shall give to you and you shall be satisfied. Did He not find you an orphan and provide refuge? And did He not find you astray and guide you? And did He not find you without means and provide sustenance? So as for the orphan – do not oppress him. And as for the beggar – do not drive him away. And as for the grace of your Lord – proclaim it. In the days before Christmas, I confess that one of my favorite parts of the story of the birth of Jesus, or Isa ibn Mariyam, is the coming of the Magi, and the legends that have grown up around them. In Christian tradition, the Magi, also referred to as the Three Wise Men, Three Kings, or Kings from the East, are said to have visited the baby Jesus after his birth, bearing gifts of gold, myrrh and frankincense. The word Magi is a Latinization of the plural of the Greek word magos, itself from Old Persian maguŝ from the religious/priestly caste into which Zoroaster was born. As part of their religion, these priests paid particular attention to the stars, and gained an international reputation for astrology, which was at that time highly regarded as a science. Their religious practices and use of astrology caused derivatives of the term Magi to be applied to the occult in general and led to the English term magic. The Gospel of Matthew (2:1-16), the only one of the four Gospels to mention the Magi, states that they came “from the east” to worship the Christ, “born King of the Jews”. Although the account does not tell how many they were, the three gifts led to a widespread assumption that they were three as well. Their identification as kings in later Christian writings is linked to Old Testament prophesies such as that in Isaiah 60:3, which describe the Messiah being worshipped by kings. The Syrian King Seleucus II Callinicusis recorded to have offered gold, frankincense and myrrh to Apollo in his temple at Miletus in 243 BC, and this may have been the precedent for the mention of these three gifts in the Gospel of Matthew (2:11). It was these three gifts, it is thought, which were the chief cause for the number of the Magi becoming fixed eventually at three. While oftentimes conflicting lore muddles the story of the Magi, those bearing gifts for the Christ child are most often named Caspar of Tarsus, Melchior of Persia and Balthasar of Sabia, which was the ancient name of Yemen/Ethiopia (as in the Queen of Sheba/Sabia). Weary from desert travel, the Magi humbly offer their gifts. Caspar is young, European, and offers gold. Gold finances the Holy Family’s coming flight to Egypt and also symbolizes Christ’s immortality and purity. For his generosity, Caspar receives the gifts of charity and spiritual wealth. Melchior is middle-aged, Persian and offers myrrh. Myrrh is a fragrant gum, which the ancient Israelites believed to strengthen children. This symbol of Christ’s mortality was blended with wine and offered to him on the cross, and also mixed with aloes to wrap his body for the tomb. Melchior receives the gifts of humility and truth. Balthasar is elderly, Ethiopian and offers frankincense. Frankincense is a resin used in incense for worship and also symbolizes prayer and sacrifice. Balthasar receives the gift of Faith. And Christ, humbling himself to become man, offers us the greatest gift of all, the light that forever burns in the darkness. 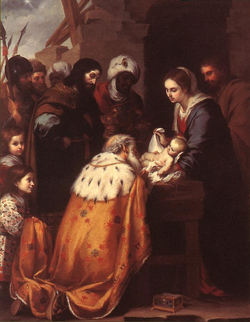 Note: The above painting is Adoration of the Magi by Bartolomé Esteban Murillo (1617-1682). May God bless the 20 lights that went out today, and the six adult victims, and may He give peace and comfort to all their families. Amin! You are currently browsing the Darvish blog archives for December, 2012.